The Olivetti company was founded by electrical engineer Camillo Olivetti (1868-1943) in 1908. The 40-year-old Olivetti established a factory in his home town of Ivrea in northern Italy, and initially produced a range of typewriters to his own design. As the business expanded in the 1920s and 30s the company established branches in Spain and in several South American countries. 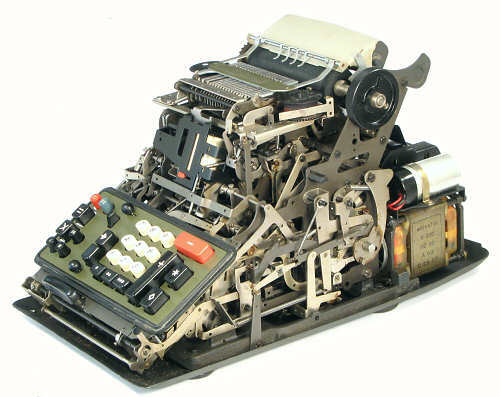 A very successful range of mechanical printing calculators was added during the reconstruction period following the 1939-45 war. The company expanded into the American market with the purchase of the Underwood typewriter company in 1959. 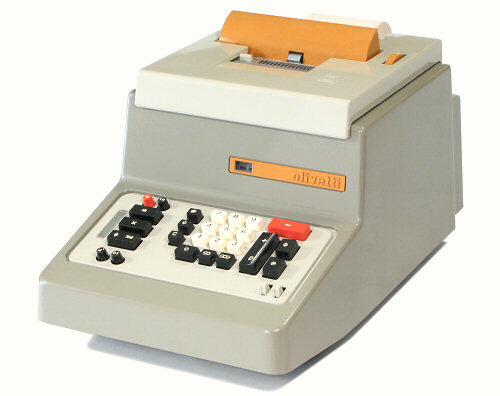 Olivetti moved successfully into electronics with the production of a mainframe digital computer (the ELEA 9003) in 1959, and a programmable desktop calculator/computer (the Programma 101) in 1964. The company had several changes of ownership and direction during the 1970s, 80s, and 90s, with new interests in personal computers, office equipment, and telecommunications. The company became part of Telecom Italia in 2003, and celebrated its 100th birthday in 2008. 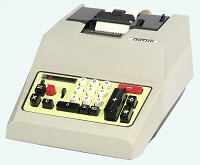 Electronic calculators are still made and sold under the Olivetti name. The Olivetti company always paid great attention to the aesthetic design of its products, with engineers working alongside noted artists, architects, and industrial designers. 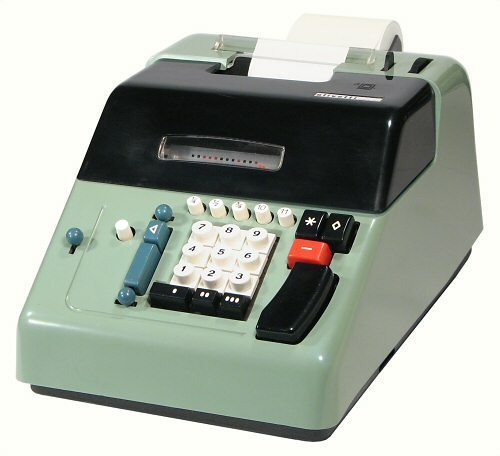 Engineer Natale Capellaro developed the basic mechanism of the Olivetti calculator in the late 1940s, while architect Marcello Nizzoli designed the cases and external details. Olivetti machines from the 1960s and 70s were crafted by well-known industrial designers including Ettore Sottsass and Mario Bellini. Several of Olivetti's products are now regarded as classics of modern art. Olivetti calculators first came to prominence in Australia as replacements for Sterling add-list machines during the decimal currency conversion in 1966. 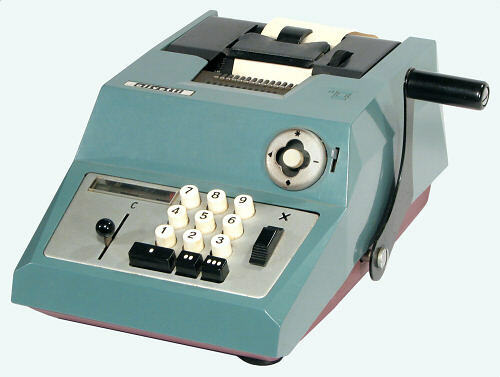 The "Prima 20" machines were made available with a substantial Government subsidy (up to 100% in many cases), and were supplied in great quantity. Olivetti calculators are generally identified by class numbers (20, 22, 24, etc) which describe the basic internal mechanism, and by names (Prima, Summa, Divisumma, etc) which describe the functions available. 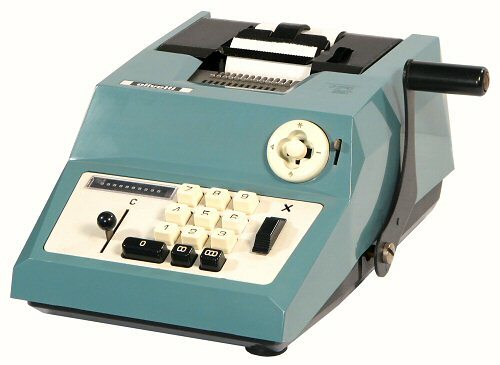 The Elettrosumma 14 is a basic but very substantial electrically-operated add-list machine from Olivetti's early post-war period. 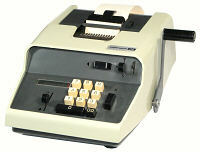 The Summa 15 is a manually-operated "ten-key" machine with two additional keys for Sterling currency. Operation is similar to a decimal machine, but with automatic restrictions on the values that can be entered in the pence (first, or rightmost) and ten-shilling (third) columns. Pressing the 10 or 11 keys enters the value and immediately locks the keyboard, so that the current column perforce becomes the rightmost. The third-last place is always the ten-shillings, and will only ever register 0 or 1, regardless of the key pressed. Entering values in the common format of (say) 37/6 will register only 17/6, instead of the expected £1/17/6. 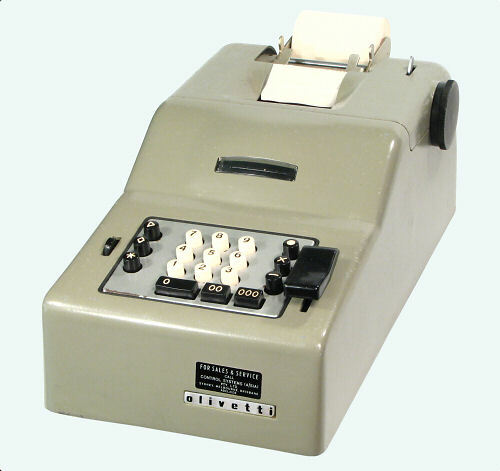 A small lever above the keyboard can be set to disable the three Sterling columns, so that the machine will operate in the normal decimal mode on the seven leftmost columns. The single-digit window to the left of the keyboard counts the number of cycles in each place when the machine is set for multiplication mode. The machine is designed for one-handed operation, with a unique four-way joystick replacing the usual pushbutton function controls. The joystick is easily operated by the right thumb as the hand approaches the main operating handle. The joystick mechanism is described (in English) in US Patent 2545649 (Capellaro, 1949-51). 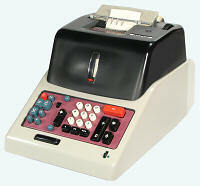 The Prima 20 is basic 10-key office adding machine with add, subtract, total, and sub-total. As a manually-operated machine it retains the joystick and most of the functions of the Summa 15 (above), but is less than half the weight. The mechanism sits in a pressed-metal base with a moulded plastic cover. The "missing" front foot is actually located about three inches towards the rear. 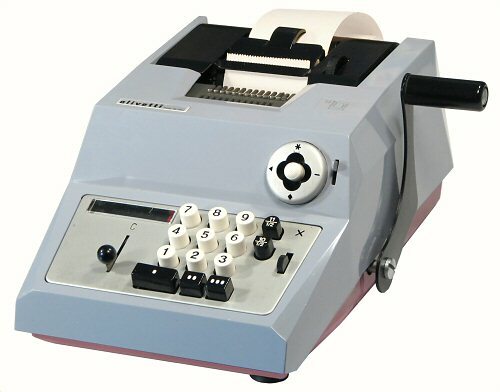 This 1960s machine operates in either Sterling or decimal currency, as selected by a small lever on the under side of the base. An early Prima 20 for decimal currency. This machine was built in Italy, but others found in Australia have come from the Olivetti factories in Argentina and from assemblers in South Africa. These machines were supplied as replacements for Sterling add-list machines during Australia's conversion to decimal currency in 1966. 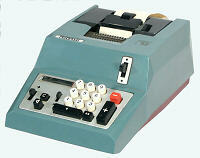 Most of them were retired in the early 1970s, after relatively little use, in favour of the new electronic calculators. They can still be found in large numbers, and are generally still in good working order. 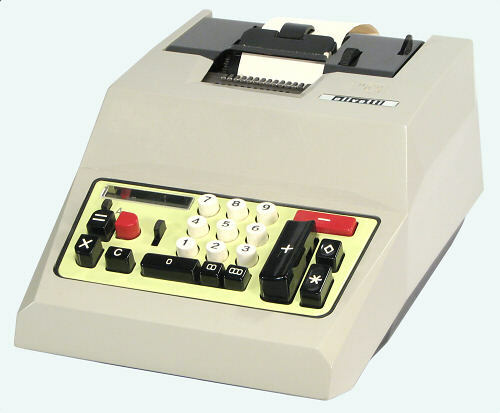 A late-model Prima 20 for decimal currency, with square keytops and a white plastic bezel around the function joystick. The purple sheet-metal base has been replaced with a dark grey plastic tray. The Quanta 20 is a motorised version of the Prima add-list machine. The joystick has been retained for Total and Sub-total, but on a motor driven machine the other functions are more easily controlled from the keyboard. The Quanta 20R is a "reduced" version of the Quanta 20, with only 8 places in the keyboard and 9 in the result and printing mechanism. It has square keys, a grey plastic base, and asymmetric feet, but is otherwise the same as the Quanta 20. This machine was built in the Olivetti factory in Argentina. A larger 10-digit machine in a similar plastic casing, with all of the controls on the keyboard. A 10-digit machine with a multiplication function, rather than just a "Repeat" key. 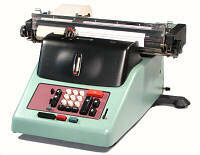 The Elettrosumma 22 is a large, heavy-duty add-list machine from the 1950s and 60s. It has 12 places in the keyboard and 13 in the result mechanism. The printing mechanism has another four hand-settable print wheels to the left of the numeric columns. It accommodates paper up to 100mm wide. This Sterling-currency version has five additional pence keys (1/4, 1/2, 3/4, 10, and 11) located just above the main keypad. A 12-column version of the lightweight Elettrosumma machine, in a re-styled plastic casing by the Italian designer Ettore Sottsass (US design patent D209638, 1966). 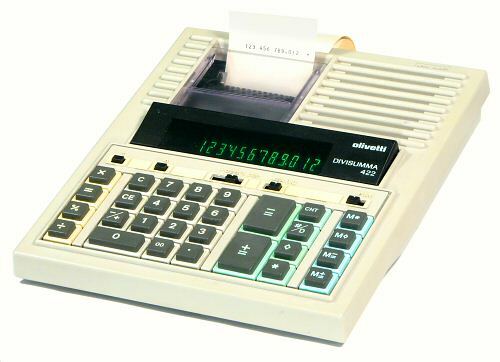 The Olivetti Divisumma 24 (D24) is a large full-function printing calculator with fully automatic automatic multiplication and division. The calculating mechanism was designed by engineer Natale Capellaro, and the exterior by the noted architect and industrial designer Marcello Nizzoli. The machine first appeared in 1948 as the manually-operated Divisumma 14, in a casing similar to the Elettrosumma 14 (above). The machine was extensively redesigned in 1956 to become the Divisumma 24, which continued in production in various forms well into the 1960s. The D24 operates as an adding machine in the normal manner, with keys for add, subtract, total, and subtotal. To divide, the dividend is entered into the accumulator with the add key, and the divisor is set on the keyboard. When the division key is pressed the machine completes the calculation automatically and prints the quotient and the remainder. Problems in multiplication are entered as written, eg "123 x 456 = ". The machine stores the first value, performs the calculation, and prints only the result. There are options for controlling the printing of totals and accumulated subtotals during repeated multiplications. The Divisumma performs short-cut multiplication for numbers over 5. It takes 6 machine cycles to multiply 5 x 5, but only 3 cycles for 2 x 2 or 9 x 9. The internal storage register which holds the first factor in a multiplication is directly accessible from the keyboard (via the M and IM keys), and can be used as a general-purpose memory register. Values can be entered directly or back-transferred from the accumulator, and can be returned to the accumulator or used in a subsequent multiplication. The Multisumma 24 is essentially the same as the Divisumma 24, but without the automatic division. This 24-series Elettrosumma is fitted with an automatic power-driven paper carriage for bookkeeping and accounting applications. The machine is larger and heavier than the previous models to provide stability for the rapidly-moving carriage. The extended rear feet are an integral part of the cast-iron baseplate, which is over 30mm thick in places. The painted covers are metal die-castings instead of plastic. The basic calculating mechanism is common to all the members of the 24 series. 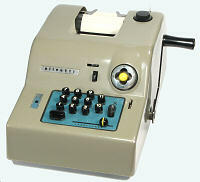 The Elettrosumma omits the multiplication, division, and memory functions, but has an improved date-setting mechanism operated by the small red levers to the left of the main print wheels. The date can be printed on demand in the format 01 JAN 99. The paper carriage accommodates rolls, sheets, and printed forms. The platen roller is divided about 75mm from the left-hand side, allowing forms to be changed without affecting the continuous tally roll. 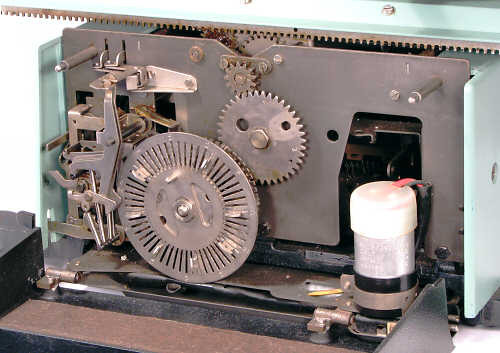 A full-width cover at the rear of the machine provides access to the carriage programming mechanism. Cam plates are selected according to the functions required, and are inserted in the corresponding positions around the 55-place drum. The drum rotates in synchronism with the carriage movement, and controls the functions of the machine through an array of sensing levers at the left-hand side. Carriage programming mechanism - rear view (29kb). The Divisumma 26GT is a further development of the 24 series, with a number of changes and improvements to the mechanism. The angular casing and its bright orange trimmings are the work of the famous Italian designer Ettore Sottsass. Production of these machines continued into the 1970s. Olivetti acquired a controlling interest in the American Underwood typewriter company in 1959, and used the Underwood name primarily on machines intended for the American market. 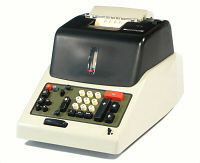 This Underwood 200 was sold in Australia by Stott & Underwood, a long-established firm of office equipment suppliers with obvious overseas connections. The Underwood 200 is essentially the same as the Olivetti Prima 20 above, but in a re-styled plastic casing. The only difference is that the four-way joystick control on the front panel has been replaced with two separate levers operating at right angles. The nameplate claims that the machine was made in Italy by Underwood Italiana rather than by Olivetti. The Underwood 400 is essentially the same as the Olivetti Elettrosumma 22 above, but in a re-styled plastic casing. The electric motor in this machine is dated 25 Feb 1965. The Olivetti company produced a mainframe digital computer (the ELEA 9003) in 1959, and a revolutionary transistorised programmable calculator/computer (the Programma 101) in 1964. A cheaper non-programmable version of the P101 appeared in the late 1960s (the Logos 328), followed in 1970 by the re-designed and IC-based Logos 200 series. The machine illustrated was built in March 1972. The Logos 200 series consists of four similar machines (240, 245, 250, 270) with slightly different combinations of functions. All models include a mechanically-encoded keyboard, a 28-column impact printer, and an acoustic delay-line memory similar to those in the Programma 101. The complex transistor logic boards of the P101 have been condensed into about 150 SSI (Small-Scale Integration) IC chips, mounted on a single large circuit board that covers the entire base of the machine. The exterior of the Logos 200 series is the work of noted industrial designer Mario Bellini (1935- ), and is shown in his US patent D225533 (filed in 1970). 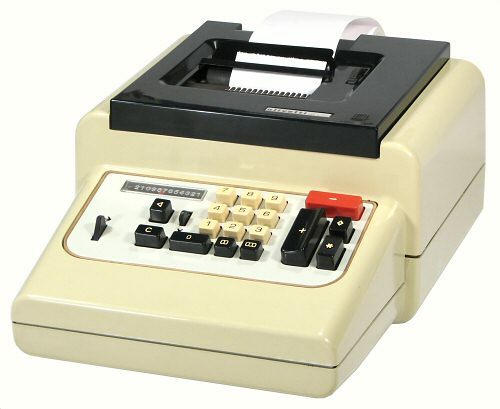 The machine uses coloured backgrounds around the keys to show the logical groupings of functions, and places the printer to the side of the keyboard rather than above (as on the previous mechanical calculators). A 200-LSI series introduced late in 1972 replaced the 150 chips of DTL logic with three custom MOS-LSI chips, while retaining the same casing and mechanical components. A more detailed description of the internal mechanism is available in the Technical section of this site. The Logos 50/60 series followed on from the Logos 200 in 1973. The new machines replicate the functions of the earlier series, but in less than half the volume and weight. The 50/60 machines have new printer and keyboard mechanisms, with a MOS-LSI chipset similar to that of the 200-LSI series. The new machines were housed in a striking wedge-shaped casing in die-cast alloy, again designed by Mario Bellini. A more detailed description of the internal mechanism is available in the Technical section. The Divisumma 18 is a portable battery-powered calculator which performs only the four basic arithmetic functions. An internal printer records all entries and results, but there is still no separate numerical display. 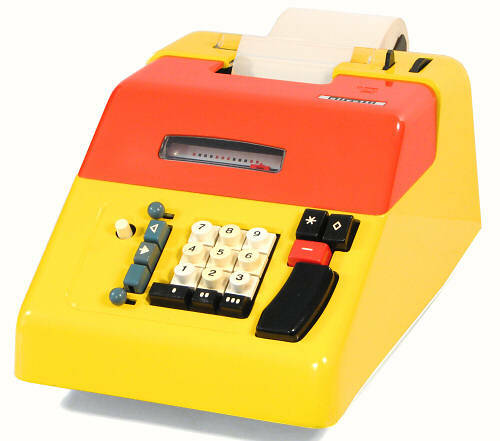 The calculator is known mainly for its radical styling, again designed by Mario Bellini, and in particular for the soft-touch rubber moulding which covers the whole of the keyboard area. The machine is featured in the Museum of Modern Art in New York. 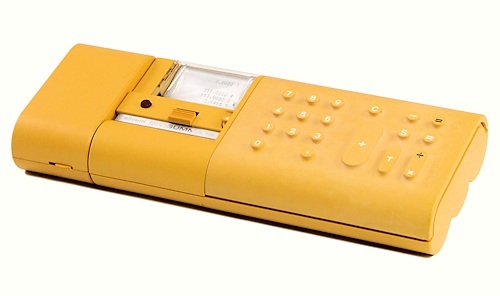 Olivetti's traditional attention to industrial design continued well into the electronic era. This Divisumma 422 from the 1980s continues Bellini's use of different background colours to enhance the logical separation of the keyboard functions (although in a rather more subtle manner than on the Programma and Logos machines). Even the internal elastomeric key sheet, seen only by assemblers and technicians, is an elegant blue colour instead of the usual black or grey. The small impact printer gives a particularly clear and well-formatted listing. 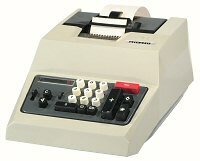 The circuitry uses just one 64-pin chip (Hitachi HD614042S) and a handful of minor components to far surpass the capabilities of the mechanical calculators above. A brief history of the Olivetti company and its approach to industrial design is available (in English) on the Telecom Italia historical web site. 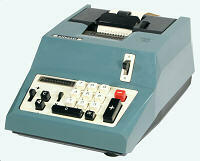 Olivetti's current home and office products can be found on the Olivetti Tecnost web site. 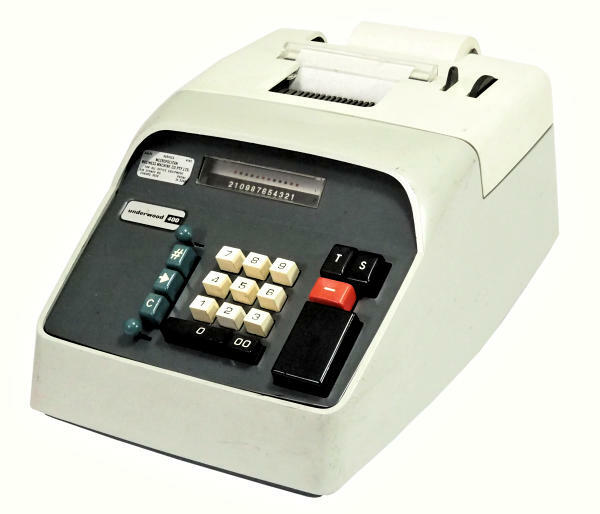 More detailed descriptions of the internals of the Logos 240 and Logos 58 electronic calculators are available in the Technical section of this site.